I stored my lawn mower in my garage all winter and now it won't start. What's wrong? Are there any safety precautions I need to take? My lawn mower tipped over and now it won't start. What do I do? What's the difference between high-lift and mulching blades? 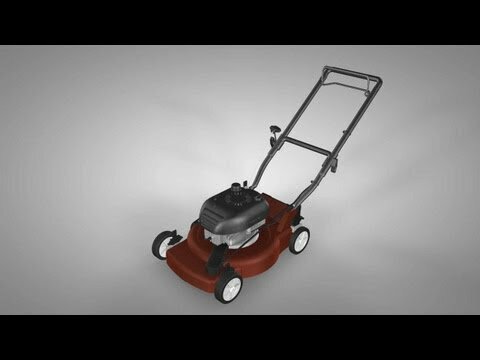 Can I use a universal blade on my lawn mower? How do I clean the buildup around the fuel cap? Your lawn mower is likely the most frequently used piece of outdoor power equipment that you own. Proper maintenance is extremely important to maximizing efficiency, reducing emissions, preventing costly repairs and extending the life of your lawn mower. The air filter has the important job of preventing dirt, dust and debris from entering the carburetor and engine. It should be cleaned or changed every 25 hours of engine operation or once per mowing season. Pleated, paper air filters must be replaced. Foam air filters can be cleaned with hot water and a small amount of detergent and then left to air dry before being saturated with new engine oil and reinstalled. Every eight hours of use, check the condition and level of the oil. Fresh oil is golden or amber in color. As it ages, it will darken. 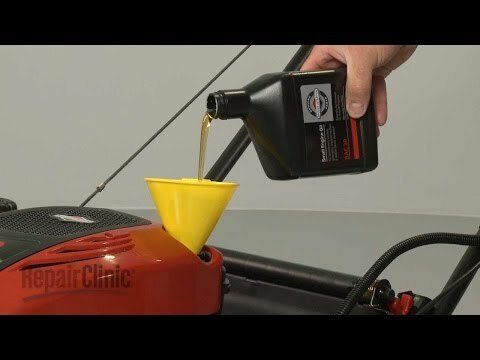 Change the oil every 50 hours of use (generally once per season). Always use the oil recommended by the manufacturer for that model. Ensure that a clean fuel filter is in place and replace it if necessary. We do not recommend cleaning the fuel filter since it is delicate and can be easily torn during the cleaning process. If your mower has pneumatic tires, periodically use a tire pressure gauge to ensure consistent tire pressure. Tires with varying pressures will result in uneven or poor cutting. Spray a degreaser on oil stains. Allow the degreaser to sit for 10-15 minutes before wiping with a clean cloth. Rinse with a hose. A tune-up kit packed with essentials including an air filter, spark plug, oil and more as needed for your engine will take the guess work and hassle out of purchasing the correct parts for a specific engine. Find the tune-up kit for your lawn mower by entering the model number. Adding fuel stabilizer will keep fuel fresher longer. Follow the owner's manual for instructions on leaving fuel in the engine during storage, as this varies by manufacturer. Look for bends, dents and other damage to the blade. To prevent risk of injury, the blade should be replaced right away if any damage is found. Also, a sharp blade is important to a proper cut. Dull blades tear the grass, rather than cut cleanly. A blade should be sharpened every season and replaced every one to three years, depending on usage. We do not recommend using a universal blade due to safety issues related to the metal used and problems with proper mounting. Use only the blade recommended by the manufacturer. Fuel caps have vent holes to allow air into the fuel tank. Use a paintbrush to brush away particles and buildup on the fuel cap. Before closing the fuel cap, inspect for blockage and replace it if there's blockage. It's a good idea to replace a spark plug once per season, even if it appears to be working fine. Over time, a spark plug's performance will degrade due to carbon build-up and a weakened electrode. This dramatically increases emissions, reduces engine performance and increases fuel consumption. Only the engine manufacturer's recommended spark plug should be used, as using an alternative can cause damage to the engine. Most small engine repair shops and auto parts stores have a free recycling program for used oil. This is a common problem often due to not winterizing the lawn mower prior to storage. The most common problem is old fuel which has become thick in the carburetor and clogged the fuel ports. Prior to off-season storage, lawn mowers should be cleaned and degreased, the spark plug should be replaced, and fuel stabilizer should be added to fresh fuel to prevent clogging in the carburetor. Lawn mowers can propel debris such as stones, plastic edging, wood chips and pieces of broken blades –at speeds of up to 100 miles per hour. Walk the area before beginning a lawn care routine. Relocate toys, hoses, rocks and sticks. Check the lawn mower blade regularly. Look for damage, bends and dullness. Blades should be replaced every year or two, depending on usage. Make sure the mower's trail shield is working properly and free of tears. Leave the mower's deflector in the position set by manufacturer. Keep children and pets inside when the mower's in operation. Be attentive to joggers, bicyclists, cars passing by and other people or pets in the area that might be struck by a flying piece of debris. It's common for mowers to stop working when people tip them to replace blades or complete some other kind of maintenance. Let the lawn mower sit for 30 minutes, check the fuel level and try starting it again. High-lift blades, a.k.a. standard blades or two-in-one blades, are the most commonly used blades for push and riding lawn mowers. Their "high-lift" design allows for greater airflow, enabling cleaner cutting and faster discharging of the grass clippings back to the lawn or into a bag. Note that high-lift blades are not an option if your lawn mower exclusively mulches or if you've installed a mulching kit on it. Mulching blades, also known as all-purpose blades or 3-in-1 blades, are designed for push or riding lawn mowers that mulch clippings. Mulching blades cut the grass and then chop the clippings into finer pieces. This mulching enables faster grass decomposition so your lawn will reap the benefits of the nutrients sooner. No. For safety reasons, you should only use blades recommended for your model by the manufacturer. The most efficient way is to use a paint brush. By simply brushing off the particles rather than rubbing with a rag, this reduces risk of dirt or other contaminants getting into the fuel system.